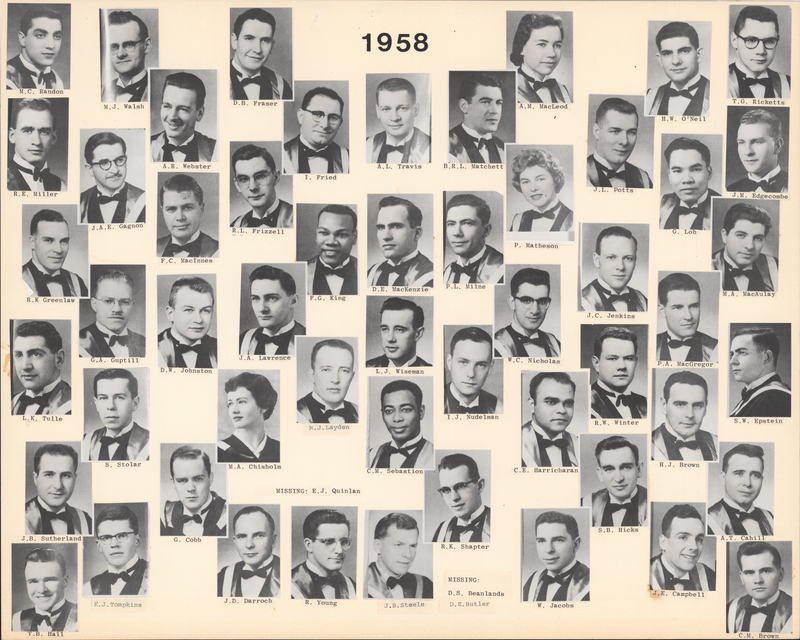 File is a composite photograph the Dalhousie Faculty of Medicine graduating Class of 1958. 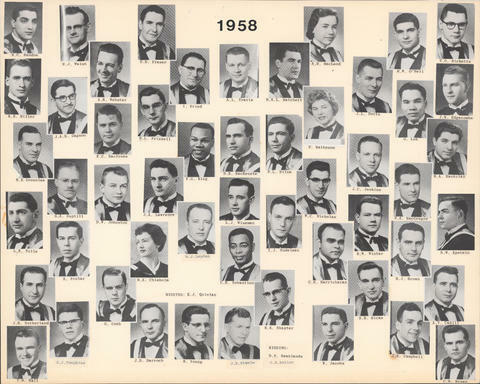 Photograph includes 53 individual portraits mounted on cardstock. Portraits include: M.C. Randon; M.J. Walsh; D.B. Fraser; A.M. MacLeod; H.W. O'Neil; T.G. Ricketts; R.E. Miller; A.R. Webster; I. Fried; A.L. Travis; B.R.L. Matchett; J.L. Potts; J.M. Edgecombe; J.A.E. Gagnon; R.L. Frizzell; P. Matheson; G. Lob; R.K. Greenlaw; F.C. MacInnes; F.G. King; D.E. MacKenzie; P.L. Milne; J.C. Jenkins; M.A. MacAulay; G.A. Guptill; D.W. Johnston; J.A. Lawrence; L.J. Wiseman; W.C. Nicholas; P.A. McGregor; L.K. Tulle; N.J. Layden; I.J. Nudelman; R.W. Winter; S.W. Epstein; S. Stolar; M.A. Chisholm; C.M. Sebastion; C.E. Harricharan; H.J. Brown; J.B. Sutherland; G. Cobb; R.K. Shapter; S.B. Hicks; A.T. Cahill; K.J. Tompkins; J.D. Darroch; R. Young; J.B. Steele; W. Jacobs; J.E. Campbell; T.B. Hall; C.M. Brown. Description created by Sophie Boucher on November 29, 2017.